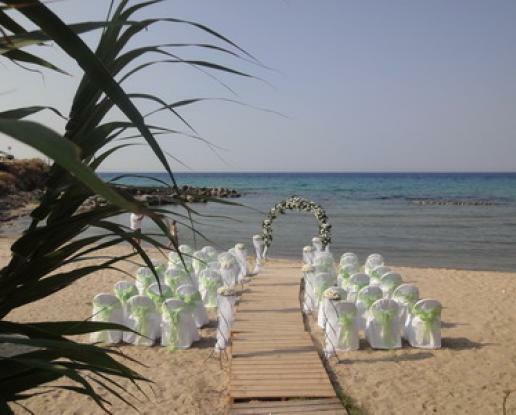 Beach weddings in Zante are very popular as the island boasts some wonderful sandy beaches. However, Zante offers many other beautiful locations for your wedding including private gardens, a beach bar, an ocean view terrace, a small island and many seafront wedding locations. 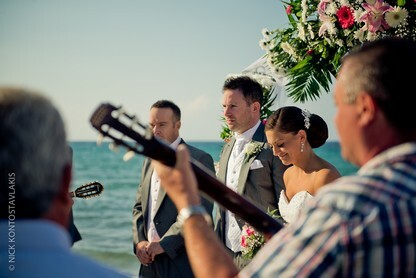 It is also possible to have a Catholic, Orthodox or Baptist wedding in Zante town. Or why not hire a private beach on a secluded island? 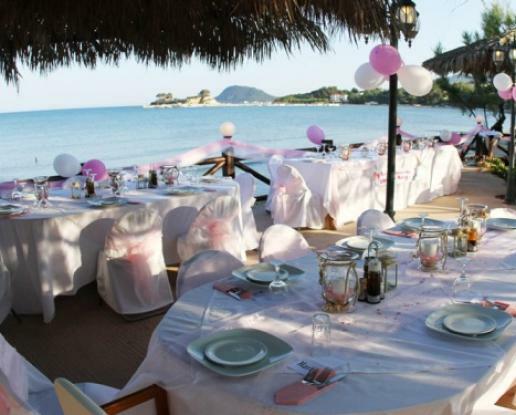 Wedding receptions can take place at beachside restaurants and tavernas or hotel gardens and it is even possible to have a beach barbecue! 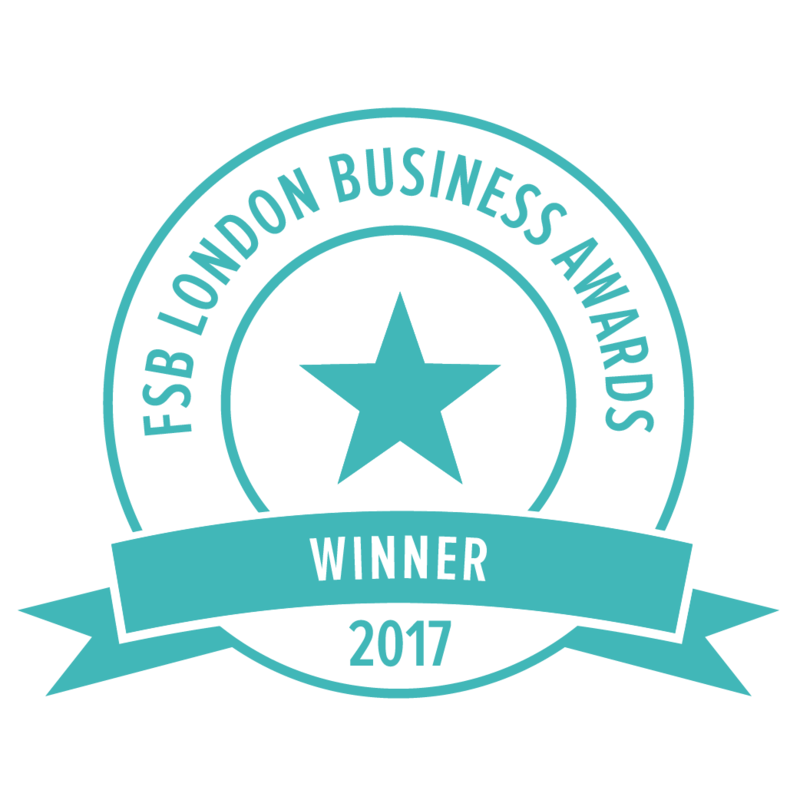 Some places allow you to party into the early hours, just ask our award winning wedding consultants for the best option for you. Greek mythology has it that Zakynthos was named after the son of Dadanus (King of Troy), who set sail from the Arcadian city of Psofida and founded his acropolis on this island to remind him of his homeland. Zakynthos is the southernmost of the Ionian Islands, 13.5 km south of Kefalonia and 15.2 km east of the Greek mainland. It is the 3rd largest in size (406 square km) It boasts beautiful beaches; those on the north, east and south coasts are easily reached whilst those on the west coast are the most spectacular and only accessible by boat. This area includes the famous Blue Caves, named for the colour of the water in the deepest hollows. Zakynthos is known in Greece as the island of song and poetry. It is thought that the god of Music, Apollo, was worshipped here, and the serenades and folk songs for which Zakynthos is famed are still an important part of the culture. The island also has many monasteries, where you can hear the mysterious and unique Zakynthian chants. 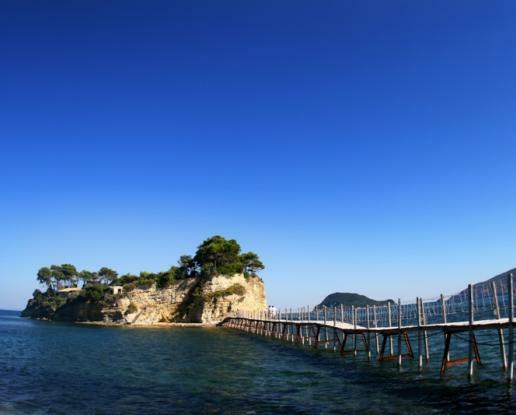 Zakynthos was the home of Dionysios Solomos, Greek national poet and writer of the Greek national anthem! Another Zakynthian highlight is the abundance of flora and fauna. The high rainfall in the winter means that a wide range of rare flowers and plants thrives here. The island is perhaps most famous for Caretta caretta (the loggerhead turtle) which lays its eggs on the southern shore of the island. This reptile is an endangered species and the Greek government has created a marine park in Laganas Bay to safeguard the loggerhead colonies and inform visitors about this national treasure. Also protected is Monachus monachus (the Mediterranean monk seal), which can be found on the western coast. Call our wedding consultants on 020 8894 1991 or click below to fill out our wedding questionnaire for more ideas and costs for weddings in Zante. Looking for a place to stay? 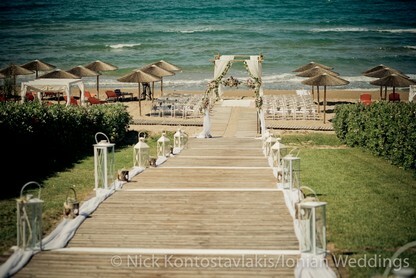 When I think back to planning our wedding, I really do not know what I’d of done without Ionian Weddings (IW). Deciding on a destination wedding was so daunting having previous no knowledge or experience, I didn’t know where to start but the team at IW were fantastic from start to finish. Helen and Gabi in the office were so supportive, helpful and encouraging, as you’d probably imagine I had a lot of questions during the whole process and I felt no point felt uncomfortable or stupid. Both were so helpful regarding elements of the process such as the legal documentation and they really helped and guided me through what I needed to do. Having the opportunity for a skype call with Helen was something I really valued, not only was it an opportunity to put a face to a name I constantly emailed but also to have an open and honest chat about our expectations about the big day. Planning a wedding and especially one abroad (and when you’ve not even been to place your getting hitched) was a little apprehensive but I felt reassured and confident that everything would go to plan. We had one small issue with the venue for the ceremony before flying out which was no fault of IW, Helen was so lovely and understanding when talking me through it as I appreciate it probably wasn’t the nicest call she wanted to make, however it all worked out in the end. On arrival in Greece, we arranged to meet our wedding planner Helen on our first night to talk through the arrangements for the big day. I cannot thank Helen enough for her advice, guidance and willingness to help before, during and after our big day, she made the day go so smoothly. We got married on Cameo Island in Zante, it was and is a breathtaking venue and we had our reception at Mamma Mia, again an amazing venue and the food was stunning. Our wedding day is one we’ll never forget, surrounded by our family and our friends - it was truly magical! 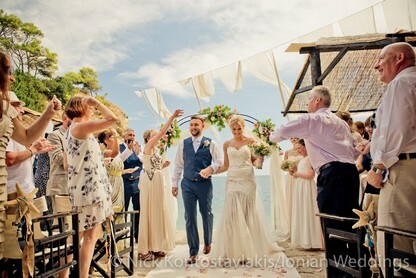 I would recommend Ionian Weddings in a heartbeat!!! Absolutely fantastic, could not fault the service from start to finish! Anett was very helpful and reassuring all the way through. Helen was amazing and she made sure all day ran smoothly! Ten out of ten. All co-ordinators were fantastic, our day was absolutely amazing, could not have asked for better service! Everything was perfect - could not have asked for a better day. Everyone was so friendly and extremely helpful throughout the entire process. Our Destination Wedding Coordinator has made the event run perfectly and ensured everyone was having a good time! We loved every minute of our wedding day it was perfect and we couldnt have dreamed of a better day! 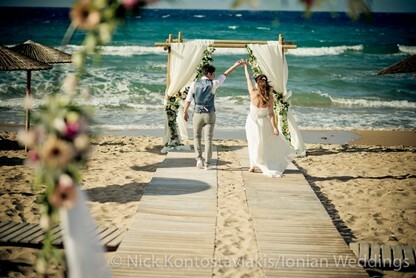 Thank you Ionian Weddings - especially Helen and the local co-ordinator ♡ They were amazing we felt so comfortable with them, they made our wishes come true and it was a truly perfect day! What would make your perfect wedding day? Take our 5 minute wedding questionnaire and tell us all! Now you can - call for a chat to arrange a personal consultation. Would you prefer to talk to us rather than browse? Call us now on 020 8894 1991 if you would like to chat about your dream wedding. Use our exclusive wedding mood board to find your dream wedding venue.